As a certified dementia consultant who has worked with hundreds of families dealing with the effects of Alzheimer’s and other dementias for a decade, what do I like about this book? Mara Botonis has taken years of knowledge and experience, and hours and hours of research and compiled it into an understandable, and more importantly, actionable guide for families to use during their journey with a loved one who has dementia. The organization of the book is logical. It begins with the philosophy of care (Biography Based Care) as the first ingredient of a successful plan to achieve the best care possible for a loved one with a dementia. Then it moves on to give answers to specific everyday problems that caregiver’s experience, such as with communication, bathing, eating and incontinence. Excellent suggestions they are too. The thing that makes this book stand above others is that these answers are easily consulted “on the fly”, meaning in the heat of the battle, and that’s what caregivers need most, instant suggestions to try. As an extra added benefit this book also provides guidance for issues in the future by providing the needed tools for each family to create their own ongoing plan of care, to be initially completed themselves, and then reviewed and readjusted as the disease progresses. Help for now and a plan for the future based on the individual’s specific needs and behaviors. 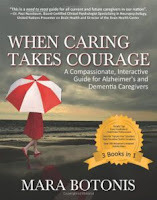 Finally, Mara devotes the last portion of the book to the most successful method to address what is known as “behaviors”, the actions of persons with dementia that are detrimental to themselves, their caregivers and others. That method is activity/redirection for the person with dementia. It helps keep the person off or on a lower dose of antipsychotic drugs. These drugs are so bad for persons with dementia. They can actually lower cognition in some, and turn others into “living zombies”. Not only does Mara talk about the methodology of activity based behavior modification but gives the reader many specific activity suggestions which can be used by the caregiver. The reader is not left on their own to dream up activities for their loved ones. This is true help! My final conclusion: Buy this book NOW! Don’t wait another minute!